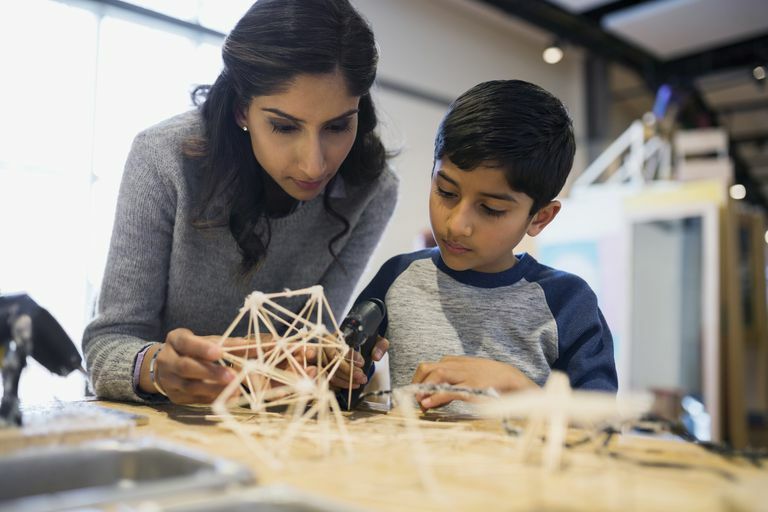 Helping your child with his science fair project is a lot easier once he decides what type of project he’d like to do. There are five basic types of science projects to choose from. An investigative science fair project is the most common type. It involves using the scientific method to create a hypothesis and an experiment to test the hypothesis. For example, posing the question “Do plants grow better when fertilizer is used?” and then experimenting to come up with an answer. You can introduce your child to the concepts of having a control group, limiting variables, measurement, and determining the significance of results. The key will be to find a question that interests your child and an appropriately easy way to test it in the amount of lead time you have. You may also need to explain that negative results also further science. A research project is basically a science report. It involves collecting information about a specific topic and presenting what you have discovered or learned. It’s typically best to start with a question. For example: “How does El Nino affect weather patterns?” You can discuss different information sources with your child and which are considered to be more reliable or authoritative. Also, discuss the need to make the presentation in her own words rather than copying what she finds. This type of project shows a known scientific principle, such as the earth's magnetism, the force of gravity, or surface tension. Often, it recreates a classic experiment that originally proved the concept. This type of project may not be advanced enough for older students. A model science fair project involves building a model to demonstrate a principle or concept. Ideally, what your child builds will be unique, but there are classic projects like the baking soda volcano, or the Mentos and Diet Coke volcano. The challenge here will be to come up with something your child can build that will be different. It's better to find a model to build that interests your child but isn't one that is very common. This type of project can either be very interesting or very dull, and it may not be considered to be advanced enough for older students. It consists of a collection of like items, often from natural sources, and descriptions of them. A collection of leaves can be very pretty, but not very informative. It’s important that your child’s collection presents an overview or insight into a topic. For example, looking at leaves from different neighborhoods and noting variances in appearance or growth based on the sunlight, pollution, etc., in each neighborhood involves some scientific investigation involved. Choosing a science fair project can help interest your child in science and technology. You will need to ensure they have selected one that can be done within the limits of time, expense, and your child's abilities.